You can use up any leftover chocolates from your Christmas stash, but omit the sugar if using milk chocolate, as otherwise it will be too sweet. Roll out the thawed pastry disc to line a 20cm flan tin with a removable base. Prick the surface with a fork, line with non-stick baking paper and fill with dried baking beans. Bake in the oven for 15 minutes, then remove the paper and beans and put back in the oven for another 5 minutes to finish cooking the base. Put the chopped chocolate in a heatproof bowl. Put the cream, butter and sugar in a small pot and heat to just below the boiling point, stirring to make sure the sugar has dissolved. Pour the hot cream mixture over the chocolate and leave to stand for 5 minutes before mixing well with a fork. When all the chocolate has melted and the mixture is shiny and smooth, pour it into the cooled pastry shell and allow to set at room temperature, which should take 1 or 2 hours. 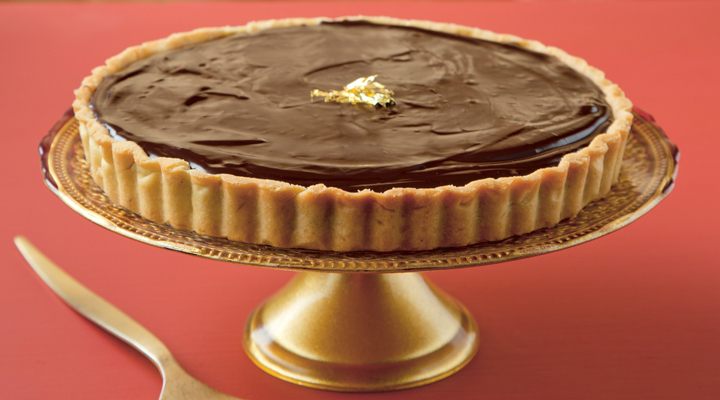 This tart is extremely rich, so smaller slices are recommended. It might be too rich for whipped cream but the big flavours are magic with a strong coffee or pot of steaming tea.